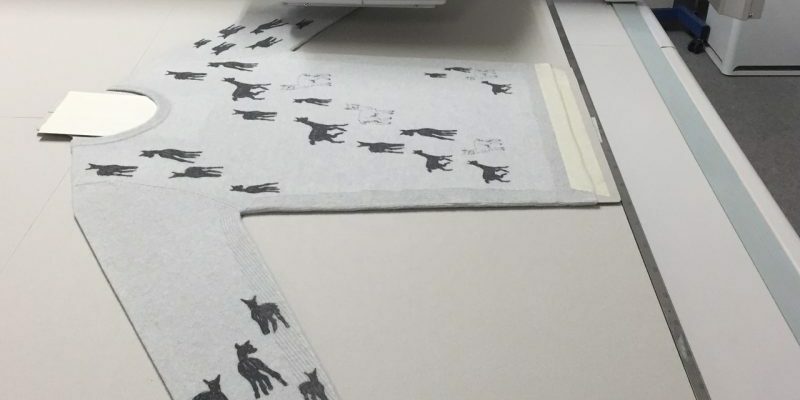 A year ago, I discovered Faering a company based in the Midlands who specialise in luxury digital textile printing including fabrics such as knitwear. This innovative technology caught my eye as I could see it as a great vehicle for brands to use it as an up cycling method for an unsold stock as you can print onto plain knitwear as well as textured fabrics. A fantastic way to reduce wastage and rework into the seasonal stock to reduce the pressures of fast fashion. 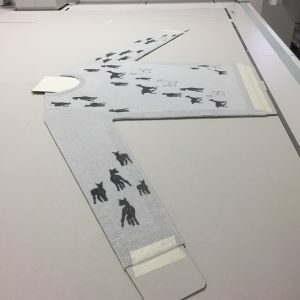 I was so excited to work with this technology and test out its capabilities, I commissioned my sister, Artist Florence Sweeney to create a linear artwork inspired by the alpaca herd I work with in the Scottish Borders. 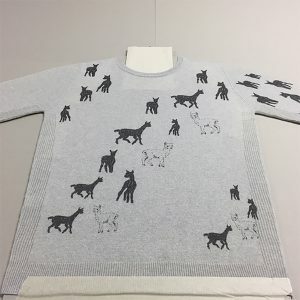 I wanted to test the detail of the printing, as a fine linear pattern such as the alpaca’s face, is quite hard to achieve through hand intarsia and jacquard. Though the digital printing looks like a quick process, I was intrigued by how many steps there are to get to this point, including washing the jumper to make sure there is no chemicals or softener on the fibre, making a custom block, setting the pattern, approximately 3 hrs per piece. After the printing, (2-3 mins on each side) the print needs to set and then be rewashed to remove excess ink. All the inks used are compliant with the ZDHC (Zero Discharge of Hazardous Chemicals) Manufacturing Restricted Substances List which leaves a residue free finish. The end result, the most luxurious fabric with a fine line illustration that looks like it has been knitted into the garment. Discover the Hand Drawn Alpaca Print jumpers in the first Childrenswear collection. 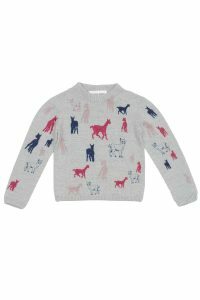 Celebrating true innovation of the knitwear industry, the Leyre jumper is made in Britain using a state of the art whole garment knitting machine, giving a seamless finish to the children’s jumper.